Can Guinea Pigs Eat Too Much Timothy Hay? One of the things about guinea pigs is that’s they need to eat. In order to do this, they need regular foods to chew on day and night to keep their teeth from growing. One of the foods that they absolutely love is Timothy hay. Timothy hay is dried Timothy grass which is a type of grass found in Europe. When grown in its natural habitat it can grow from 48cm to 150cm tall depending on the conditions and the soil it grows in. It typically grows in heavy soils, but if it happens to grow in dry and sandy soils it can survive as well. To turn into Timothy hay, timothy grass is dried but the great thing about this type of hay is that it keeps its green color and its freshness. This is what makes it so popular with guinea pigs. By having hay and in particular types such as Meadow hay or Timothy hay it enables guinea pigs to be able to chew on a consist basis. 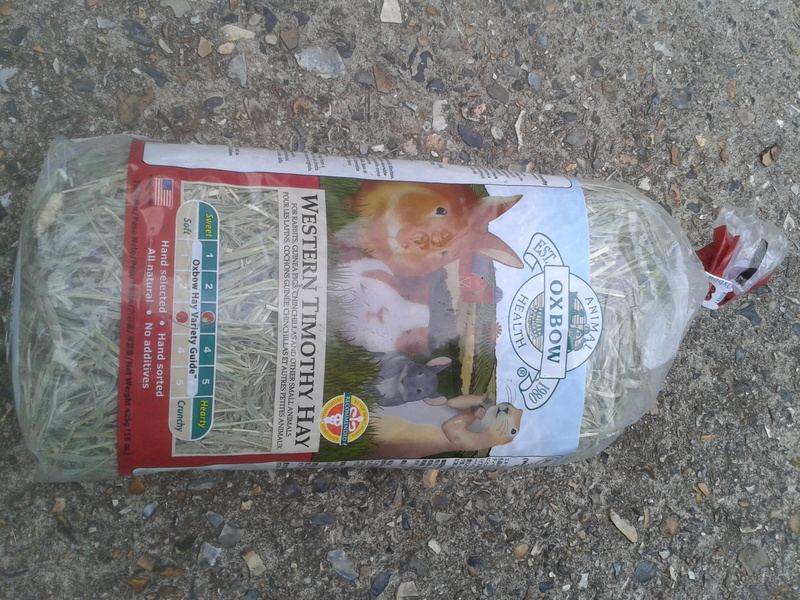 We’ve seen how good Timothy hay is for them and the benefits it brings to your guinea pigs. However is Timothy hay a food that they can over-eat? If you feed Timothy hay to guinea pigs regularly they will eat because they love it. However, it is a food that they can eat all the time and it isn’t bad for them at all. In fact, it is good for them. So don’t be so concerned about guinea pigs eating too much Timothy hay as you’re actually doing them good by doing so. This is because the nutrients that it contains are of real benefit to them and barely contain anything of detriment to them. Hay is the most important food for a guinea pig to have as part of their diet. It should take up 75% of their food intake. Unlike other rodents like hamsters, gerbils and rats and mice, guinea pigs don’t need hay as bedding. In fact, when you lay it down for them they usually just move it to the side or even just pee on it. So its important that the hay is set aside to ensure that the guinea pig can get to it but not pee in on it if they can help it. You can buy a guinea pig hay holder to keep the hay in and these can be bought from any good pet store. But you can also do this for free very easily. boars. Then I filled them both with the oxbow western timothy hay ensuring that it was sticking out both sides. I’ve read about this idea on one of the guinea pig forums and thought i’d try it out. 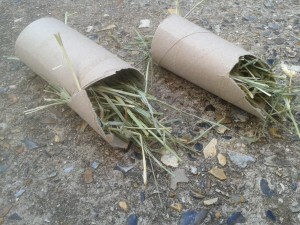 Doing it this way provides a fun way of getting the guiena pig hay for your cavy. It means they can have some fun rooting into the tube to get it. They can also enjoy chewing on the cardboard roll as well which provides an additional benefit. 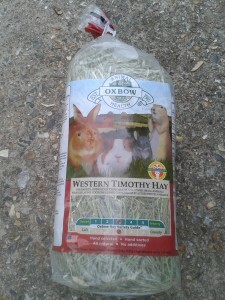 Today I stopped by our local pet store for some more Timothy Hay and picked up a bag of Oxbow Western Timothy Hay. I’ve seen Oxbow recommended on other guinea pig blogs so thought I would check it out. My previous experience with buying Timothy Hay has taught me not to buy it if it isn’t a green colour as this means it has lost its freshness and dried out too much. Once its dried out, its just not enjoyable for the guinea pigs. It was quite hard work getting my piggies to eat the last lot of Timothy hay I bought them, so I was determined not to make the same mistake. On the pack, Oxbow promise that Western Timothy Hay will be mid-range of ‘sweet’ and ‘hearty’ and mid-range of ‘soft’ and ‘crunchy’. They promise that it is preservative and additive free, which is great. It also contains Loose hay contains stems, leaves, and limited seed heads, says they packaging. Having regular hay in their diet is vital for a guinea pig as it supports their digestive system and should make up at least 75% of their diet. It should therefore be available for them to eat at all times. This was the Western Timothy hay that I was trying, other hay’s that Oxbow provide are Orchard Grass, Botanic Hay, Organic Meadow Hay, Oat Hay and Alafa. It needs to be put in a place where they won’t lie in it as its not meant for bedding, but for chewing. I’ve done that before and you just end up with soggy hay, which is just gross! So its best put in a corner or an empty toilet roll, something like that. Another thing to remember with timothy hay is to store it in a cool and dry location in its packaging away from sunlight so that it doesn’t dry out and fade. So, we put some down for one of our guinea pig’s to see how he would take to it. It went down pretty well. I took a brief video of him tucking into it. Knowing that it is full of good stuff, it was purely down to taste and it disappeared pretty quickly. My guinea pig seemed to enjoy it and was a much different experience to the previous timothy hay that I gave him. I would get Oxbow western timothy hay again.